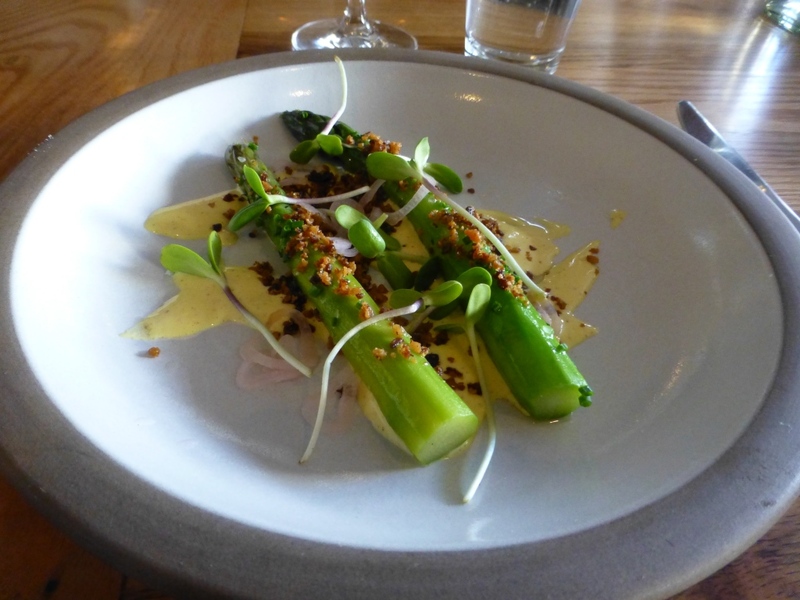 I had tried the tasting menu at Rich Table 3 months ago and enjoyed it. Now that the season was starting to change, I thought it would be a good time to go back and see what might be different. I did not have a reservation this time, but I went to the restaurant just prior to its opening time on a Saturday in hopes of securing a walk-up seat at the bar. There were only a few people ahead of me when I arrived, so I easily made it in and picked a spot at the end of the bar. The rest of the bar area did not fill up right away, but within a half-hour, all seats were taken. Some of the items listed on the menu had changed. Some of the items that looked the same were being served with different ingredients. For my wine for the evening, I selected a glass of the Chablis this time. Last time, when I was seated at a table, there was a little wait before the snacks started to arrive. And when they did, they were presented all at once. Perhaps because I was at the bar this time, the snacks were brought as they were ready.